Koftas had been my favorite when we stayed in northern parts of India.It was always a desired dish when dining out esp the malai koftas.However,as time passed and as I started cooking myself then the likes and desires changed and its been a while I had it in a restaurant too.The other day I had a packet of tuna in the refrigerator and invariably tuna puffs,tuna cutlets were made but a sort of boredom settled to these regular recipes.And so a trial and error recipe hit the taste buds here and that's this very fish koftas.These were crisp outside and soft inside and kids just gobbled them.I was very happy with the outcome and I think this recipe will grab its place in our monthly menu.Do give it a try if you are looking for a variation to our regular fish curries.I bet anyone would say 'no'and if you are a vegetarian,go ahead and give a shot with grated paneer !!! -Shape the mix in the form of balls or bullet shapes.Roll these balls in corn flour. -Heat a kadai/wok and pour oil upto 1 1/2" deep.When the oil is sizzling hot,then slide in each ball.don't overcrowd the wok.Deep fry the balls until evenly light browned,drain on a paper towel . -Heat another pan with oil listed under cream sauce.Pop the cumin seeds,add the onion and cashews.Saute until slightly browned.Add the chilly powder,turmeric powder,garam masala. -Add the chopped tomatoes and cook till tender.Add salt.Turn off heat and let it cool down.Blend this mix in the blender without adding water until smooth. -Heat the same pan and pour the blended mix in it. Add 1 1/2 cup of water and bring it to a boil. -Add in the chopped cilantro and add the cream on low flame to finish. -Add the koftas to the gravy immediately or just before serving whichever way you like the taste. 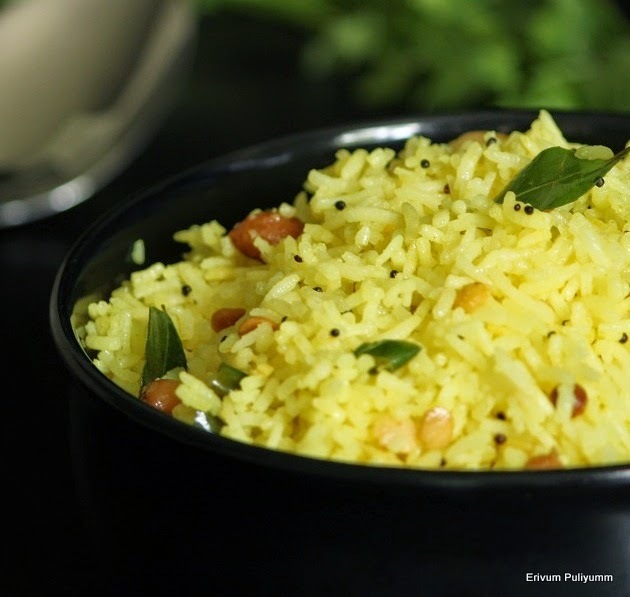 -Serve warm with chapathis,pulao or any Indian staples !!! * If you re using a packet of tuna in water,squeeze out the water completely.Similarly,after grating the carrots,squeeze out any excess water.Also make sure the potatoes are removed from boiling water immediately after cooked as potato absorbs moisture.Greek yogurt or thick yogurt is one which has no water content.Leaving moisture in the mix may interfere in making balls. 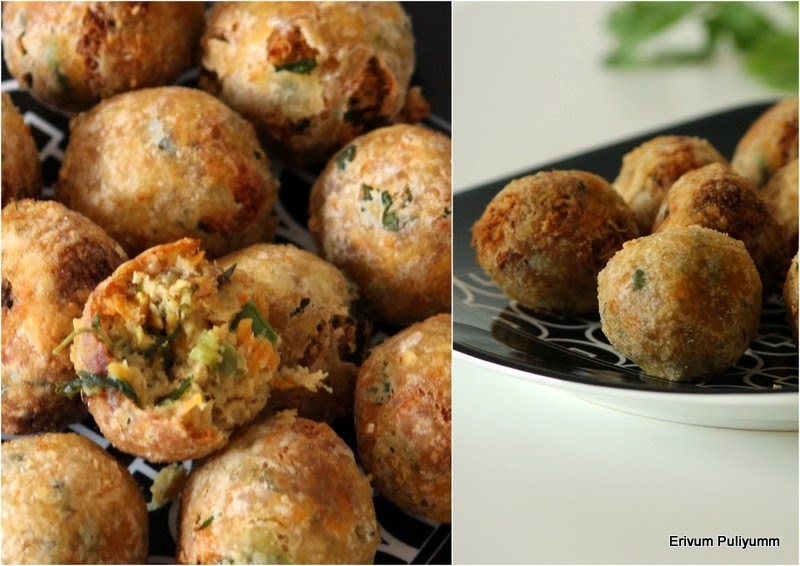 * You can use the same method to make paneer koftas.Grate the paneer. * You can even use cooked mashed chickpeas instead of boiled potatoes,works really good.I have tried that way too. 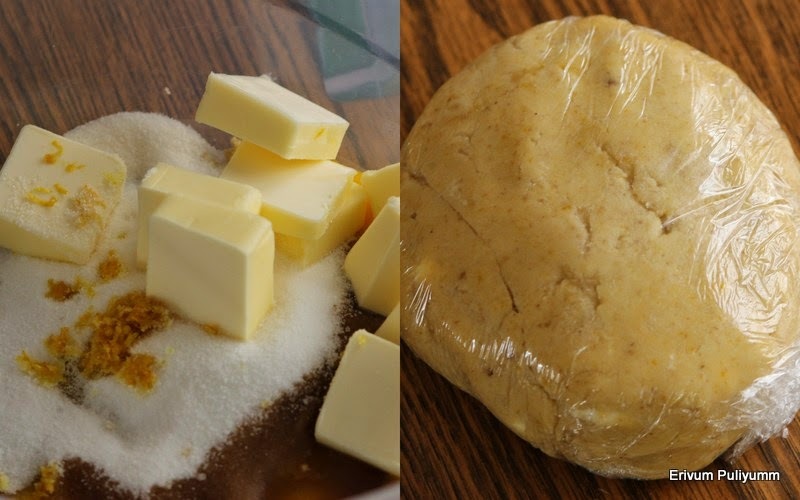 * You can use all purpose flour/maida instead of corn flour. * I love adding the koftas just before serving as the koftas soaked in the gravy for long becomes soggy.Remember that koftas once immersed in the gravy doubles in size so shape the balls accordingly. * Using red onion for making gravy as it tastes better than white onions. Coconut Fudge(Thenga Burfi) is a very nutty chewy fudge(burfi) that has predominantly coconut flavor.The cashews add the crunchy bites.This is a very simple burfi recipe and so anyone can please their sweet tooth.It hardly takes few minutes to put together.Enjoy making this simple yet elegant sweet at home to surprise untimely guests or just like that !! -Heat ghee in a non stick pan and fry the broken cashew pieces slightly browned.Remove the cashews along with ghee in a plate. -Heat water and sugar in the same non stick pan.Keep stirring until the sugar dissolves,bubbles and then reaches one thread consistency. 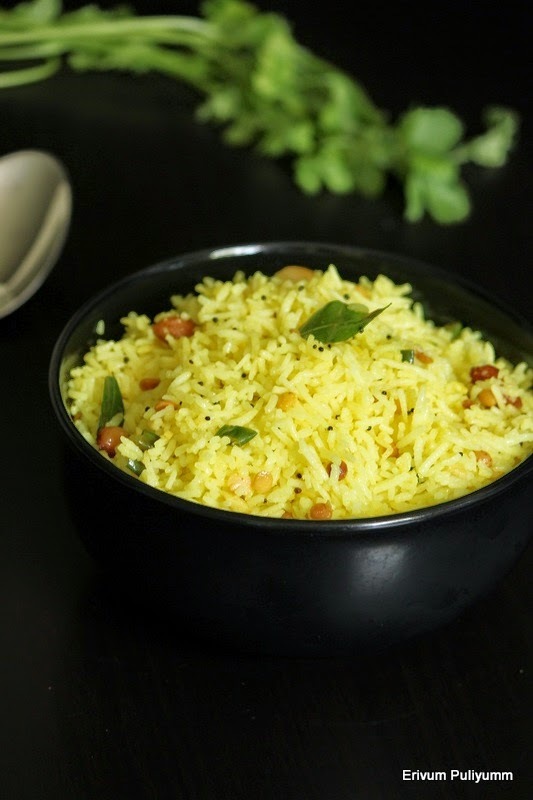 -Add the shredded coconut,ghee,fried cashews and cardamom powder.Mix well. -Transfer it into a ghee smeared plate and flatten it with a spoon /offset spatula.Draw lines to cut in square pieces when leukwarm. -Cool completely and serve or store in air tight containers. * I have mentioned 1/4 cup to 1/2 cup water because if you use shredded coconut then 1/4 cup water is required.If you are using dry dessicated coconut then add 1/2 cup water as it is too dry.I have used dry dessicated coconut. * If you're using shredded coconut then try to leave out the brown portion when scraping as it will not give a pure white color. 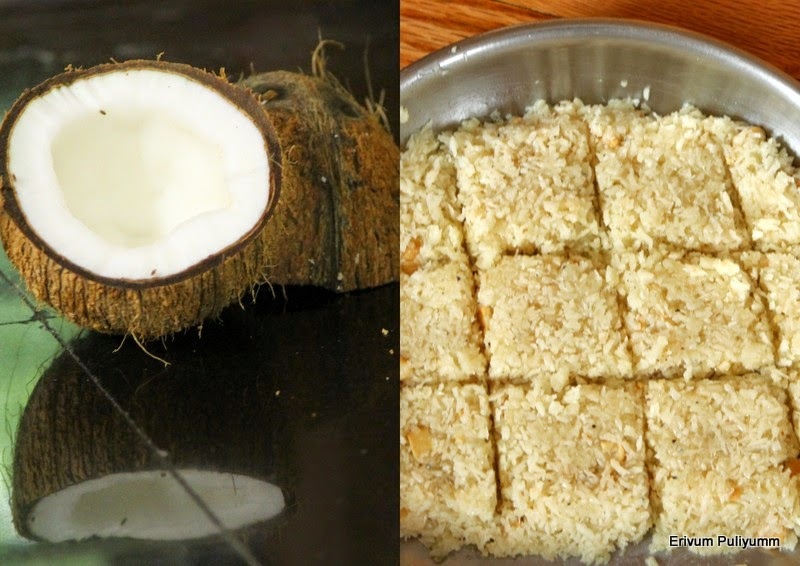 * You can pulse the shredded coconut once or twice to blend with the sugar completely. 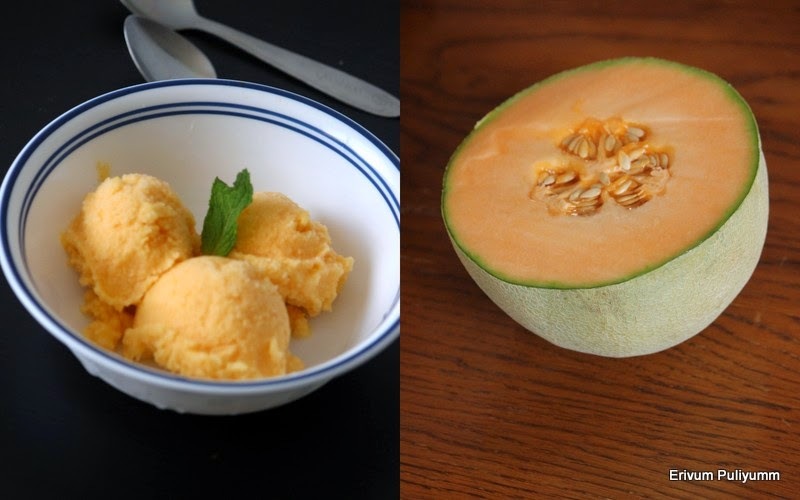 Summers are the best time to have chilled and cold smoothies,ice creams,popsicles,granitas and much more.How about a cantaloupe(musk melon) ice cream? This is one fruit which my kids don't like very much and so I always find a way to sneak in this fruit.And its this search that led me to end up making this smooth and delicious ice cream.They really liked the orange color ice cream.Try making it this summer and enjoy !!! -Wash and cut,remove the core and peel the hard skin.Dice the cantaloupe in cubes and blend it in a blender with 1 cup half n half and condensed milk.Add in the sugar and blend again. -Whip the whipped cream(very cold) until soft peaks in a cold bowl,add the pinch of salt beat again till stiff peaks. -Mix the remaining half n half,blended cantaloupe,powdered ginger,lemon juice,vanilla extract. -Gently mix the whipped cream to the cantaloupe mix.then freeze in a air tight container for 20 minutes. -Else,remove from the freezer,whisk it again using a whisker and then freeze again,repeat the same procedure till the time you no longer can whisk. -Freeze again overnight.Blend in a blender to crush the ice,smooth it in a air tight container. -Refreeze and serve chilled !!! 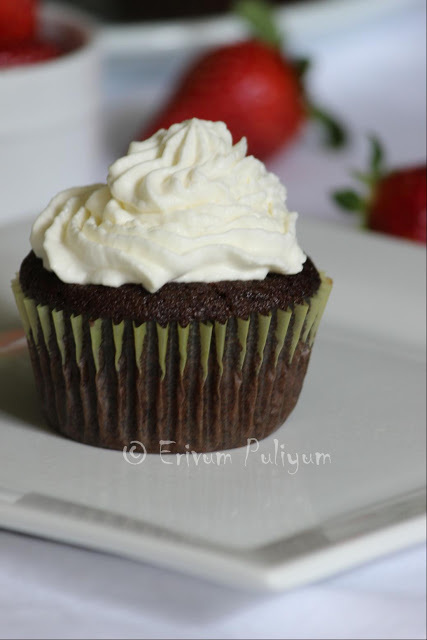 * You can use whipped cream instead of whipping cream.If you are using whipped cream,adjust you sugar as per the sugar level in whipped cream. * Omit ginger powder if you don't like the flavor. Did you know mushrooms are the only source of vitamin D in the produce aisle? These are the only exceptional one to the rule that plants don't naturally contain Vitamin D.(read it here)They also are a rich source of many antioxidants,minerals and has beta glucans(an important factor for immunity stimulating there by reducing chances of allergies).So,friends here is a simple yet delicious stir fry recipe of this nutritious veggie.It tastes similar to scrambled eggs.It is one of my mom's signature recipes which I loved a lot as a kid.And now my kids love this too.Enjoy this with steamed rice !!! -Wash the mushrooms and pat dry on a paper towel.Clean the mushrooms by peeling the outer smooth skin.Finely chop the mushrooms.Keep ready all other ingredients listed. -Heat a pan with oil.Splutter mustard seeds on medium flame and then add the fennel seeds.Add in the finely chopped onion,shallots,green chillies,garlic and curry leaves.Saute till the onions become translucent. -Add in the turmeric powder,pepper powder.Saute half a minute and then add the finely chopped mushroom.Toss it well,add salt. -Cover and cook for 5 minutes,wait till the mushroom changes color and leaves out water.Uncover the lid and add in the grated coconut,cover and leave on low heat for 2 mins.Adjust salt. 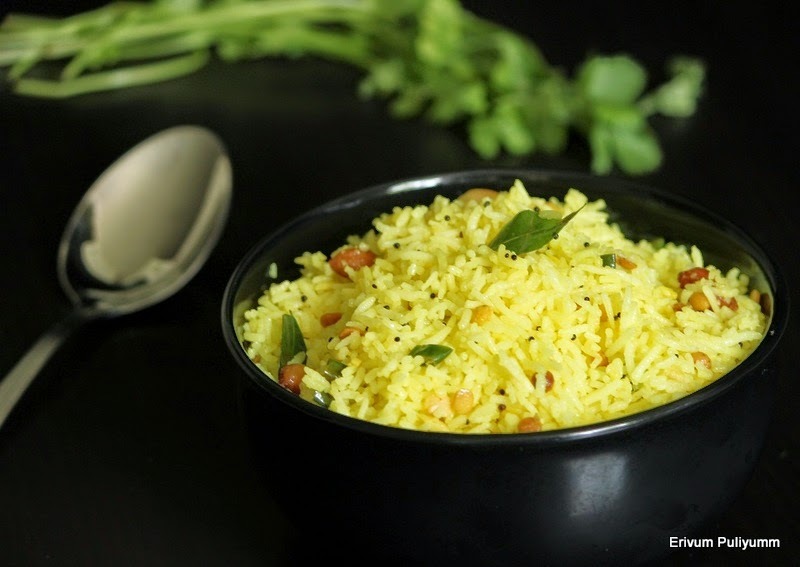 -Ensure that there is no moisture left out and is dry stir fry.Serve warm with steamed rice !!! * I have used regular button mushrooms. * Remember that mushroom once cooked will be reduced to half the original amount,so plan accordingly. * Add in salt lesser than required the first time and then adjust. * Adjust the green chillies as per tolerance. Weather has turned warmer here in our place and weekend was pretty good.I think its finally time to bid good-bye to sweaters and jackets.Today's recipe is a simple dip-Chick peas dip.As the name suggests,Chick Peas(Kabuli chana) is a perfect dip for munching tortilla chips or any other chips.This is a very healthy recipe and a quick one to prepare if you have some cooked chana left out in your fridge.You can call this similar to hummus.Another easy way to sneak in chick peas to kids without them knowing.This has a very mild spicy,tangy flavors perfect to match the chips.We just loved munching chips with it,try n enjoy !! 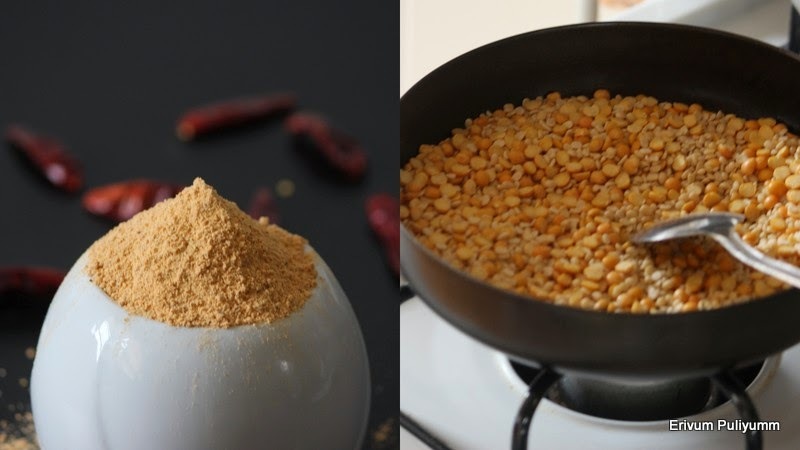 - Soak the chick peas overnight and cook the chickpeas with water,turmeric powder and salt in a pressure cooker for 3-4 whistles. - Add the chick peas,garlic,yogurt,lime juice,ground cumin,salt and pepper powder in a blender until smooth. - Mix the olive oil,chopped bell pepper and mint leaves to garnish. - Serve with tortilla chips or use as sandwich spread. * You can use vinegar instead of lime juice.And add or decrease the amount mentioned depending on your likes. * You can omit the chopped green bell pepper if you wish. * You can add little water to grind the chick peas if you wish to make the consistency as per desired taste. Idli Milagu Podi is a quick and simple recipe which you can prepare ahead and can be stored over a month.This is a handy chutney powder that hardly takes a preparation of ten minutes and can be mixed with sesame oil to enjoy with idlis.I prepared this long back with tuvar/toor dal (recipe from one of the websites)but we didn't like the taste much.However, when one of my friend,Jayanthi served us idlis with this milagu podi and payasam on the occasion of Golu on our visit to her home.I was just hooked by the taste so much that I requested her for the recipe.She was grateful to send me the recipe and the total credits of the recipe goes to her. 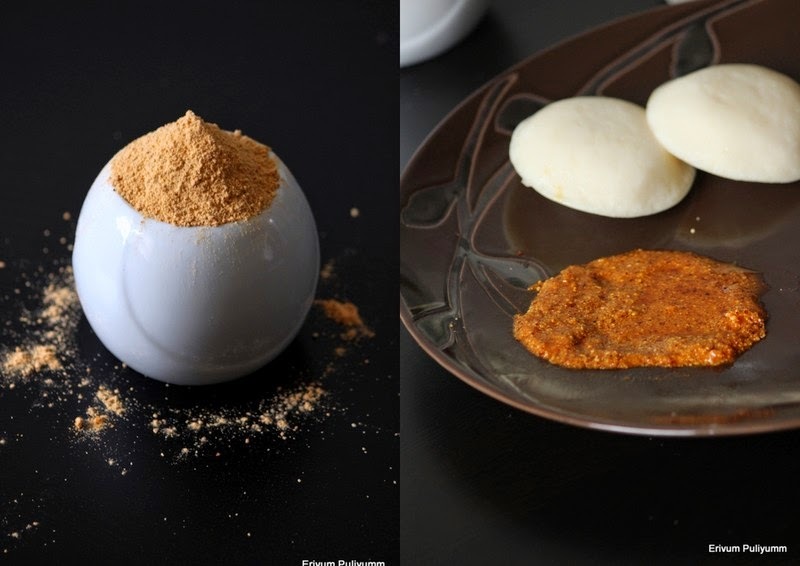 Try making this healthy podi at home and mix it with a dash of gingelly oil,Enjoy !!! -Fry the red dry chillies with a little salt(to reduce the smell).Add in the asafoetida ,sprig of curry leaves.Add salt as per taste. -Grind all together coarsely and store in a airtight container. 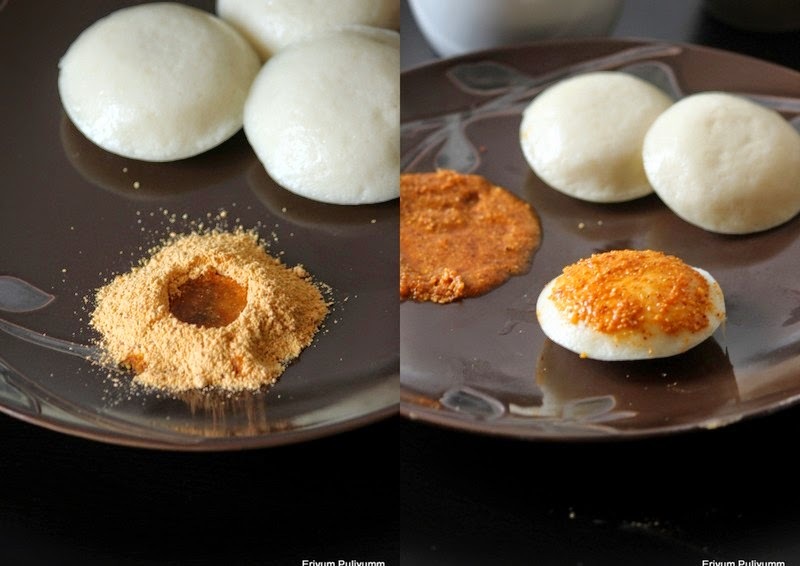 -Mix it with sesame oil(gingelly oil ) whenever required to a small batch and the idli milagu podi is ready to serve !!! 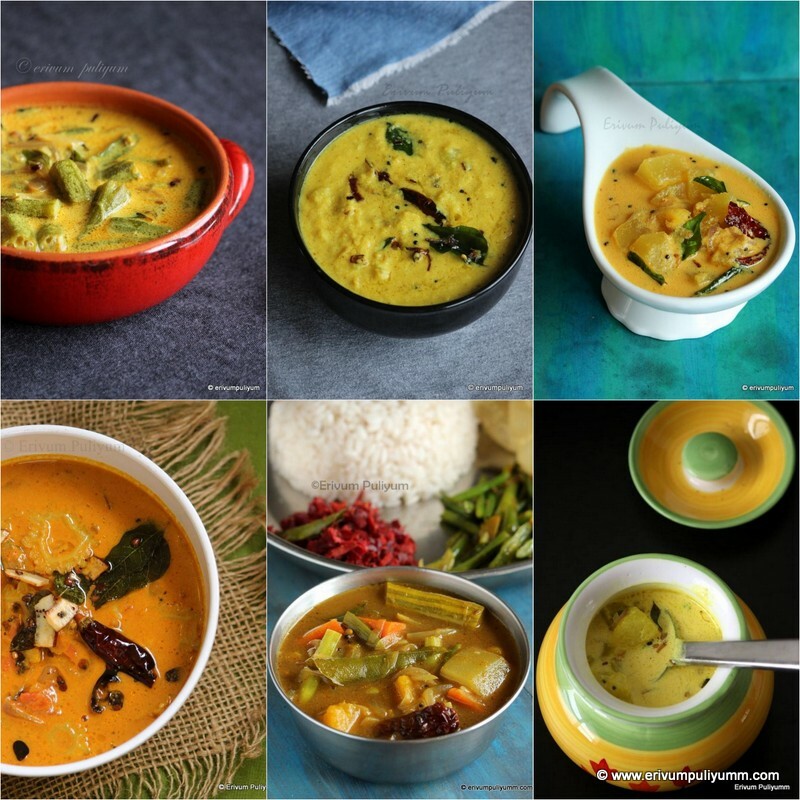 * You can omit the curry leaves if you wish. 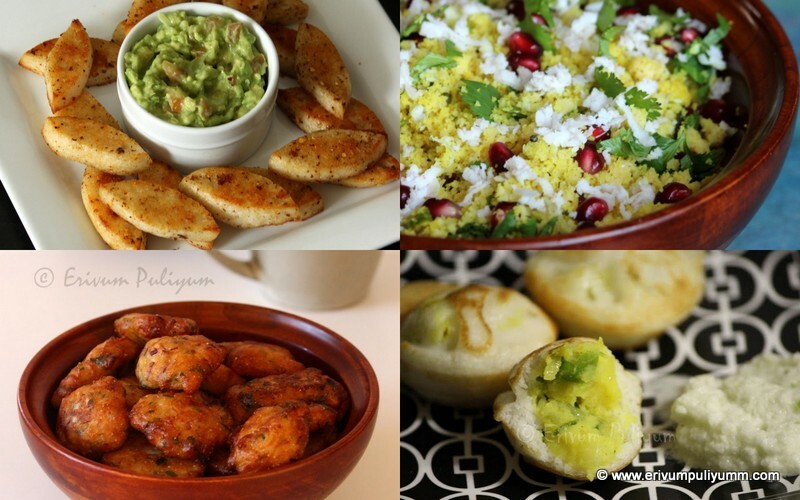 * I added 18 red dry chillies which gave a moderately spicy podi.Add as per your spice level. * You should add gingelly oil to get the exact flavor. Hope all had a relaxing weekend and are busy back again in yet another week.Today's recipe is a whole wheat chocolate waffles.I recently added a new appliance in my kitchen,the most awaited waffle maker.Kids are a big fan of waffles and that's the only reason of buying this new gadget at home.But I never wanted to try the restaurant style waffles loaded with all purpose flour.I wished to sneak in a healthy waffle that can be tried at home with whole wheat flour.I know the first thing that comes to your mind is a dense waffle with whole wheat flour but I must admit that these are very light and soft in texture and my kids really enjoyed having these with a scoop of vanilla ice cream and strawberries.This is a very healthy alternative and a varied option to regular breakfast,enjoy !!!! 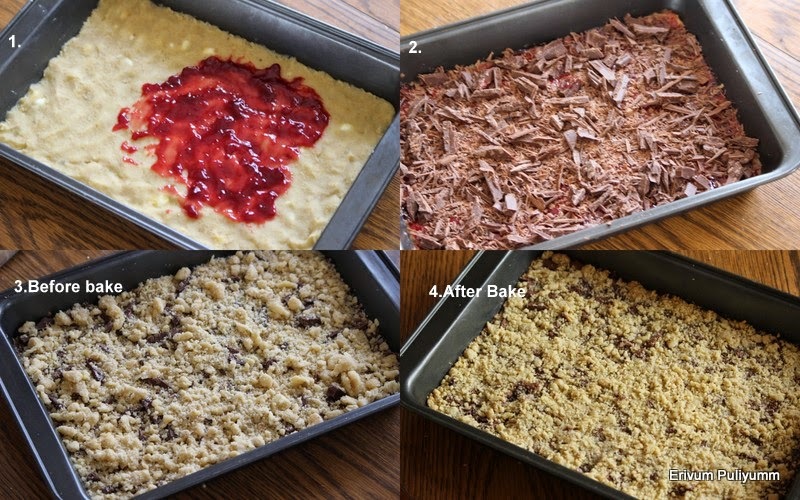 -Sift the wheat flour,cocoa powder,granulated sugar,baking powder twice,mix it well. -Using an electric mixer,beat the egg whites till stiff peaks.Fold in the egg whites to the batter without mixing it too much. -Heat a waffle maker according to manufacturer's instruction.Spray a cooking spray all around.Pour half cup of batter in each or pour using a laddle or until the plate is full reaching all over. -Enjoy them with chocolate chips or chocolate sauce or whipped cream or just a scoop of vanilla ice cream. * Sifting the flour is an important step as this will aerate the batter well. * Add a pinch of salt when beating egg whites and also the bowl in which you're beating egg white should be grease free. * Add sugar as per sweet tooth.As per this you get a bitter sweet chocolate waffles which tastes good with a scoop of vanilla ice cream.Add chocolate chips if you wish that way too.